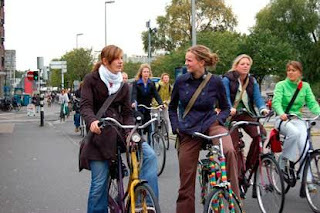 According to the June 15th Dutch Fietsberaad newsletter, "Enthusiasm and audacity are the main ingredients for local authorities to obtain high cycling percentages, is the conclusion from a study by AgentschapNL into the factors that may affect bicycle use." Enthusiasm and audacity are the main ingredients for local authorities to obtain high cycling percentages, is the conclusion from a study by AgentschapNL into the factors that may affect bicycle use. The town of Raalte served as a model in this study. It has a high percentage of bicycle use without any clearly visible reasons. There is plenty of parking space and no expensive bicycle projects have been realised. According to ThuisraadRO conducting the study it is mainly due to administrative-organisatorial factors. The presence of a group of enthusiastic leaders from all walks of life is one such factor. Bicycle use is also affected by the audacity demonstrated by local authorities, the large degree of unanimity and the continuity of approach. The integral approach, in the widest sense of the word, proved crucial for the results obtained. In addition a number of physical measures have promoted bicycle use such as the creation of a large residential area in a major part of the town, consistent right of way for cyclists and the construction of primary cycling routes along neighbourhood connector roads. Right. Here comes the critical analysis, as they say. The word "audacity" is clearly a mistranslation of something in the Dutch original. I don't know what it should be as I don't speak Dutch. It has a high percentage of bicycle use without any clearly visible reasons. There is plenty of parking space and no expensive bicycle projects have been realised. In addition a number of physical measures have promoted bicycle use such as the creation of a large residential area in a major part of the town, consistent right of way for cyclists and the construction of primary cycling routes along neighbourhood connector roads. This sounds like large-scale cycle infrastructure engineering such as has no parallel in the UK. The "primary cycling routes", in the Dutch meaning, would be fully segregated cycle tracks on the roads with all the appropriate junction designs. The picture certainly seems to show happy youngsters cycling without any concern for traffic on a large-capacity traffic-free thoroughfare. So the "lack of clearly visible reasons" mentioned early on for the success of cycling in Raalte becomes a rather difficult part of the text to understand when the whole article is examined. Maybe there is another translation problem, or maybe what is being said is that Raalte has, for some reason, succeeded in raising cycle levels more than neighbouring towns that have spent even more on infrastructure. There is no way of telling. But the quoting of the early part of this somewhat confused text, without the end (which doesn't make it much longer) creates rather a misleading impression to British readers. It seems to be suggesting that the town of Raalte has not spent money on high-quality, large-scale cycling infrastructure, in the usual manner of Dutch towns, but, yet has achieved great cycling success from some baffling combination of "enthusiasm and audacity". Which would seem to suit the agenda of certain UK cycle campaigners. The Cyclenation website is edited by John Franklin. Thanks for pointing out that the obvious suspects have already started quoting this press-release - even though they ignore most of what is produced by the Fietsberaad. I had a blog post lined up already about this rather misleading press release from the Fietsberaad, but I've now published it. I've ridden through Raalte quite a few times recently. As you'll see, the town has very much the same cycling infrastructure as any other "average" Dutch town. i.e. infrastructure the like of which you never see anywhere in the UK. It is from this base that they can promote cycling with "enthusiasm and audacity". David, the original Dutch is: "Hoog fietsgebruik vooral een kwestie van durf". Now my Dutch is pretty rusty, but Google Translate (I'll miss that api when they shut it down) suggests the primary meaning of "van durf" as "of courage" or "of daring". At the risk of subverting the original text I'd say that in the UK at least, a high cycling percentage mainly a matter of courage on behalf of the cyclists willing to risk their lives on our generally substandard infrastructure. I wish they finally started doing something to allow people to safely cycle instead of giving everyone excuses for not asking for good infra time and time again. My more elaborate comment can be seen on David Hembrow’s blog. Thanks for that information, Simon. I accept the corrections that John Franklin is not responsible for the content of the Cyclenation website, and also that there is nothing significant in the way the article was cut. However, it is still interesting that Cyclenation decided to publish this item when, as David Hembrow says, they ignore most of what is produced by the Fietsberaad. And it is curious that they published an item here which made no sense, when they could perhaps have gone back to the Fietsberaad and got a clarification of what it actually intended to say before disseminating it. I leave readers to decide if there is anything significant in the selectivity here. Sorry to dredge up old arguments. Simon: are you sure your web news facility doesn't allow you to publish the full article? There are many longer articles on your news page, and even on the archive page for 2011 - http://www.cyclenation.org.uk/news.php?Year=2011 - there are longer articles which pre-date the Fietsberaad clipping. So why was this article clipped and other, longer articles included in full? Why did you choose to link to that particular article on Fietsberaad, which could easily be misinterpreted as saying that cycle paths are ineffective?